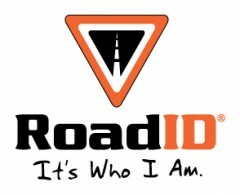 Thank you everyone for stopping by, entering to win the Road ID and sharing it with all your real and virtual friends. I am sorry this has taken a couple days longer than originally planned but I was having issues with Photobucket and my blog was looking a little bit funny so I opted to wait until all was back to normal. 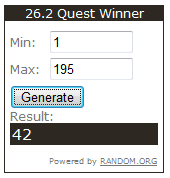 We had 195 total entries, and many good comments along the way. My brother in law who I talked about in this post entered as well, however I am hoping he doesn't win because then it will appear to be a bit fixed. I have decided that I will be buying him a gift certificate myself to avoid any appearance of being biased. I am so proud of him and how he has quit smoking and started running recently, and with some specific medical issues he really needs a RoadID when he is running on his own. Thanks everyone for entering and stopping by! If you haven't had a chance yet make sure you stop by and Like the 26.2 Quest Fanpage and follow @262quest on twitter.